As I reported last week, a recent Heimlich Institute press release opened the door to one of the nastiest skeletons in my father's closet, his relationships with a string of doctors who lost their licenses for extreme over-prescribing of narcotics, two of whom did jail stretches. Now Melinda Zemper of Oak Tree Communications (who does PR for the Heimlich Institute), my father, and Patrick Ward of Deaconess Associations (the parent company of the Heimlich Institute), have again handed me an opportunity to report about another of my father's most closely-held secrets. A couple weeks ago, Ms. Zemper issued another Heimlich Institute press release, this one promoting "Heimlich Heroes," a first aid training program being conducted in Ohio schools by the Heimlich Institute. It's the white lab coat. It's been over 35 years since my father had a reason to wear one in a professional capacity. (In the mid-1970s, Dr.) Heimlich's career as a surgeon was drawing to an ignominious close. There had been at least one incident when he passed out at the operating table, leaving another surgeon to finish the job. 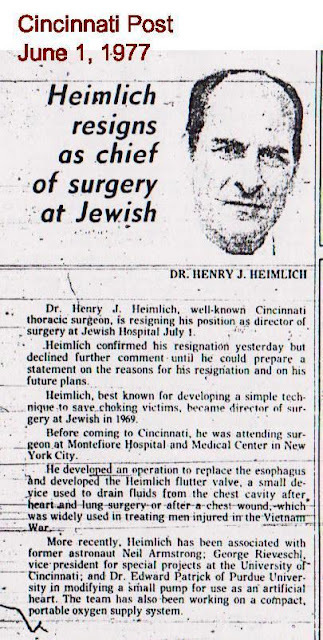 Heimlich was having trouble obtaining malpractice insurance, Peter (Heimlich) claims, and his personality hadn't endeared him to the rest of the Jewish Hospital staff. In 1976 he left the hospital. Two corrections, courtesy of documents from the Heimlich Archives. First, the year my father left Jewish Hospital was 1977. Second, he didn't just leave. He got canned. 57 years old at the time, my father quit practicing surgery, never again maintained a medical practice, and spent the rest of his career as a celebrity doctor.